Following Binny's knock, Mayanti took to Twitter to hit back at trolls who inquired about her husband's whereabouts and whether he is still in the picture or not. 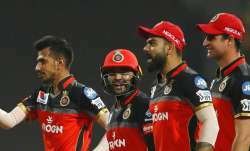 The all-rounder slammed a blistering 11-ball 33 but couldn't get Rajasthan Royals past the line as Kings XI Punjab defeated Rajasthan Royals by 12 runs. Following Binny's knock, Mayanti took to Twitter to hit back at trolls who inquired about her husband's whereabouts and whether he is still in the picture or not. Take a look. In the match, Skipper Ravichandran Ashwin and opener KL Rahul played pivotal roles as Kings XI Punjab produced a superb all-round performance to script a comfortable 12-run win over Rajasthan Royals in a second leg IPL clash to bring their campaign back on track.